If you’re heading down the highway with your pride and joy in tow, these 10 boat trailering tips will help make the ride copasetic. 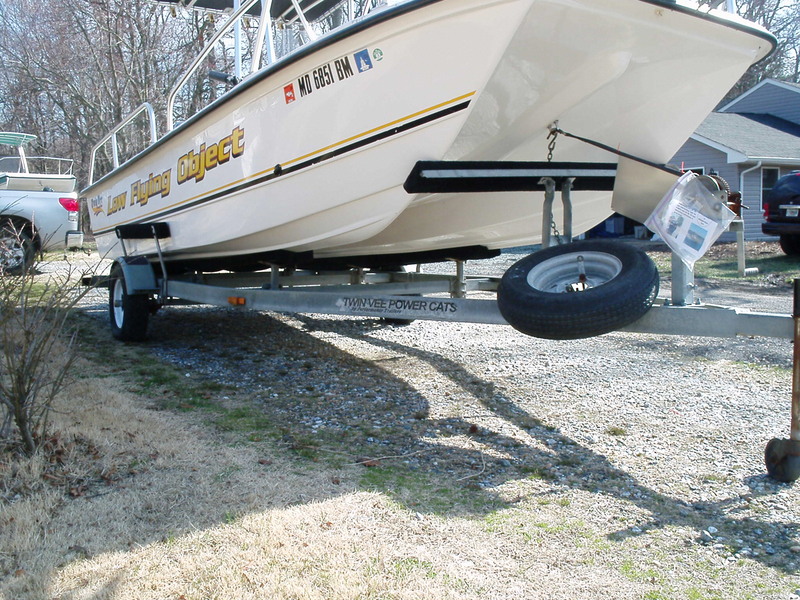 In Boat Trailering Disasters – Don’t Do This! we took a look at some of the things trailer boaters do that can lead to horror on the highway. On the flip side of the coin, there are, of course, many things that we all should do when we trailer our boats to make sure the trip is a smooth one. Whether you’re an experienced trailer boater or you just purchased your first mobile rig, these 10 boat trailering tips are sure to help make life on the road uneventful. Unless you have a rig like this (yes, it’s actually street-legal, though if you smile too much while driving, you’ll get some bugs in your teeth), you’ll want to put these 10 trailering tips to good use. Every time you stop for fuel, food, or any other reason, walk around the trailer and touch the wheel hubs. They should ideally be cool to the touch, or ever so slightly warm. If one feels like it’s on fire and you yank your hand back in pain, you’re about to blow a bearing and you need to get it serviced asap. Whenever you’re launching in the brine, if there’s no hose at the ramp you use, carry a gallon jug of water with you. The moment you pull the trailer out of the saltwater, give your brakes a splash-down. 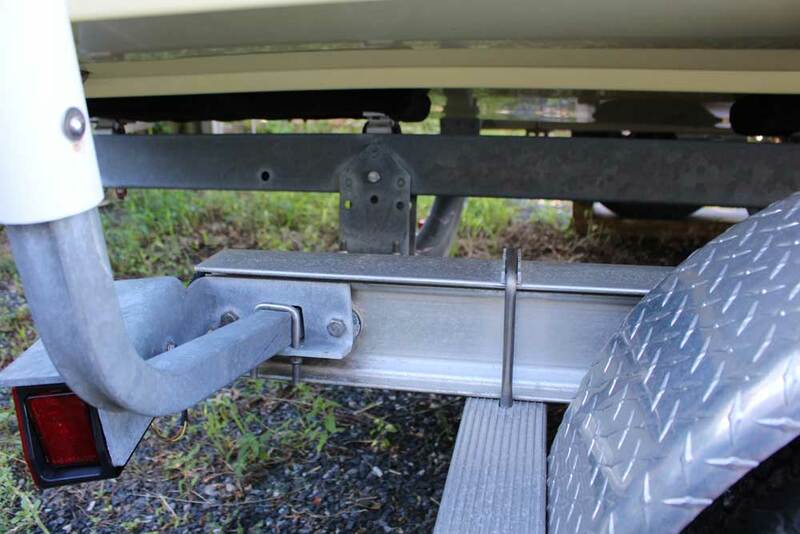 The brakes are often the hardest-hit part of a trailer used in salty environments, and merely trailering home prior to a rinse will take a heavy toll. As soon as possible you should give the entire trailer a rinse but this extra effort can add years to your brakes’ lifespan. Never tow with an outboard tilted up, unsupported by the hydraulic rams, unless you have a transom saver. 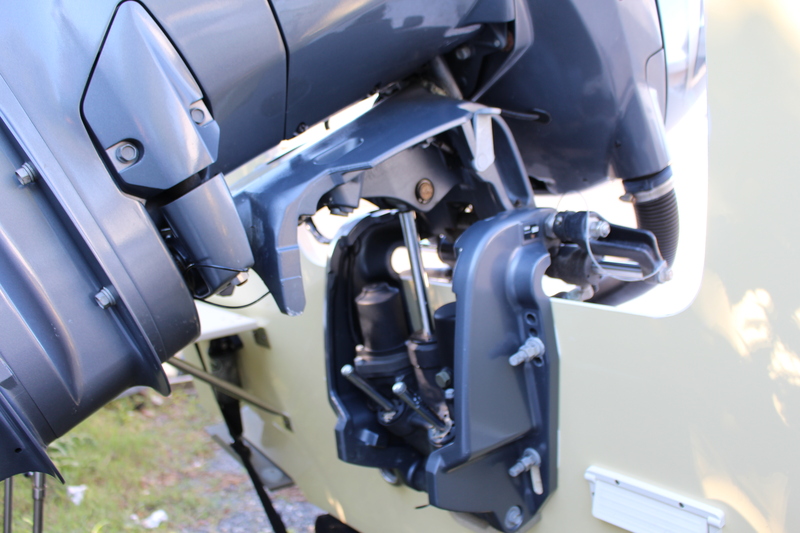 If a transom saver doesn’t fit your rig, always tilt your outboard down until it’s supported by all the hydraulic rams. 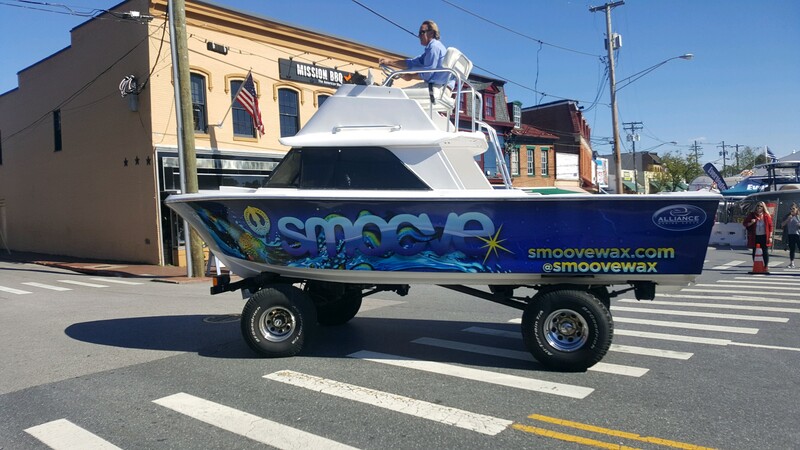 Otherwise you’re putting a huge amount of stress on the boat’s transom when the engine rocks and while it may make you feel better if the prop and skeg are three feet above the asphalt, as long as the lower unit is no lower than the lowest part of the trailer, the extra height is irrelevant. If any part of the lower unit is still too low, you can gain a bit of height by taking a two-by-four, placing it between the motor mount and the engine, and tilting down until the wood is firmly wedged between the two. As a matter of practice, every season at least once go around the trailer and snug all the bolts. If you don’t do this with some regularity and after five or six years of hauling give it a try, you’ll be shocked at how many loose ones you might find. Make sure chines align with the bunks, as opposed to sitting on top of them. When you pull your boat after a day on the water, always lean over and take a peek at how the hull is sitting on the bunks. Make sure strakes are butted up against the bunks, not sitting on top of them, or the boat’s likely to shift when you hit a bump on the road. At least once a season, remove the spare from your trailer then put it back on. Naturally, you should check it for air pressure, too. But the idea here is to actually pull the nuts and bolts, because (especially if you launch and retrieve in saltwater often) over time these can corrode and weld themselves in place. A little grease or Tef-Gel will go a long way to prevent corrosion. That spare won’t do you one iota of good, if you can’t remove it from the mount when you need it. If you don’t have LEDs, pull the light plug prior to launching or those incandescent bulbs may pop. Pull the light plug when you arrive at the ramp, prior to splashing the boat. Otherwise when you back down and tap the brakes, the hot bulbs hit cool water and can break. (If you have LEDs, this isn’t an issue). Pull the pins and remove Bimini tops completely prior to long hauls, and never tow with a Bimini erected. Pull the pins and completely remove Bimini tops prior to long hauls. The mounts take a beating when you’re on the road, and a ton of road grime can get into the Bimini’s fabric if it’s not covered with a boot. Yes, this is a PITA, but it will extend the service life of your top significantly. 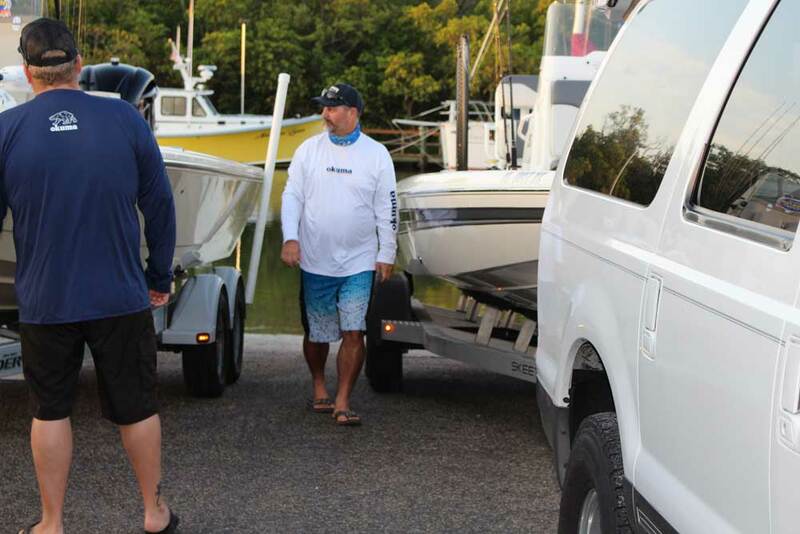 Note: Never – NEVER – haul your boat with the Bimini erected. Those tops simply aren’t designed to handle the wind-blast of highway speeds and a single trip can utterly destroy them. If you detect any sway in your rig at high speeds, take your foot off the accelerator and keep the wheel as straight as possible without touching the brakes unless it’s absolutely necessary. As soon as possible, pull over. You need to redistribute the load. 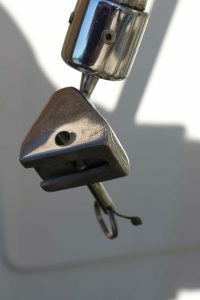 Swaying is usually the result of too little tongue weight (it should be 10- to 15-percent of the load) and shifting the boat or gear forward is often all it takes to eliminate the issue. We know you already know this stuff, but it would be downright negligent not to say: always check the lights before every haul; always use straps to secure the rear of the boat and (crossed) chains in addition to the winch strap or cable on the bow; always insert a pin or lock in the coupler; always grease the bearings on a regular basis; always keep the tires inflated properly; and always, always, always make sure you’re following your state’s laws as regards trailering (the AAA Digest of Motor Laws Trailer Towing page has a good run-down with links to each state’s regulations). Whew – that’s a lot to keep track of. 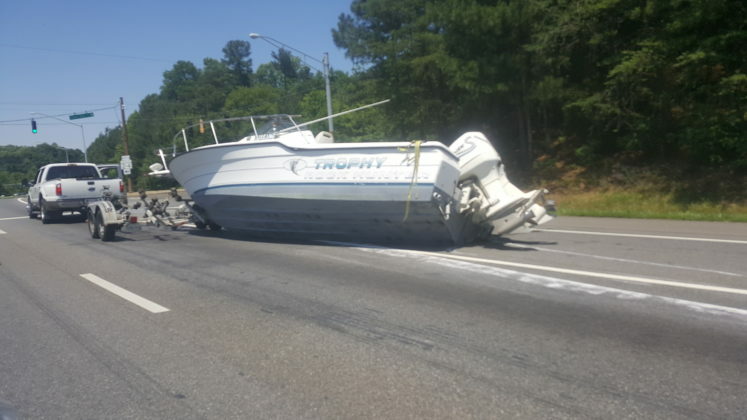 But it’s imperative to be exceptionally careful about trailering a boat, because the results of a mistake can be monumental. Let’s save the adrenaline rush for after we’ve reached the fishing grounds, shall we?